When you’re going about your day, it’s easy to see how you could miss something if you weren’t looking for it. For example, we’ve all seen those videos where a celebrity dresses as a common person to try and surprise strangers. As you’re watching, you may wonder how they can’t put it all together. But as they say, hindsight’s 20-20! 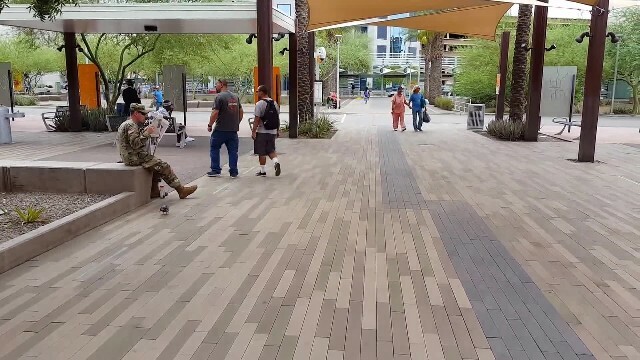 When a soldier came home from overseas a month before he was expected to arrive, the last thing his mom was doing was looking for her son out in public. The soldier had told his mom that he would be returning home at the end of July, but that wasn’t the truth. He really was coming home before that and wanted to give her a big surprise! He took a couple people with cameras down to an outdoor courtyard near where she worked. Wearing his uniform, he then sat down on a wall and waited for her to walk by. It took a couple of minutes before she finally came into view dressed in a bright yellow top. The next question was – would she pick him out of the setting even though she wasn’t looking for him? As the mom walks nearer to her son, she seems to at least notice him – but continues to walk by. She caught the sight of a soldier, but didn’t actually focus in on him. She was wrapped up in her daily routine, not thinking that her son would actually be nearby to spring a surprise on her. It isn’t until she goes completely past him that she does a few double-takes of his face. Finally it hits her who’s behind the newspaper and she shouts out and screams in excitement! It’s really a beautiful reunion you have to see for yourself in the video below. Just be patient for his mom to arrive, her reaction is so worth the wait!